Wen Zhang (left) chats with actor Guo Tao at a press release celebrating the return of their celebrity soccer team from the World Cup tour. Wen Zhang, who has rebellious tattoos on his leg and is father of a 2-year-old baby, surprised many people when he won the role of a 21-year-old autistic man in the literary film Ocean Heaven, which is action star Jet Li's first movie without martial arts scenes. "I was rejected by the producers at the beginning as they wanted somebody young, who could swim well and looked simple, but I met none of the requirements," he said, recalling waiting among dozens of teenage candidates outside the movie producers' office. "I felt upset waiting for the interview. It battered my confidence," he said, adding that he was deeply attracted by the script the first time he read it. Wen, 26, has already been in several television shows, including Struggle and Dwelling Narrowness. Through those shows he impressed with his outgoing, sunny demeanor. Few would have guessed he could play a dramatically different role with the same skill. 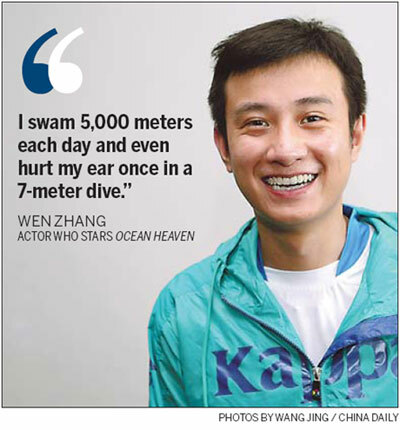 His initial failure to win a role in the movie prompted Wen to master four kinds of swimming strokes in just one week. Wen plays an artistic character, Dafu, in the film, whose only happiness is swimming in his father's work place, an aquarium. Jet Li plays the father. Once he got the role, Wen continued to develop his swimming skills. "I swam 5,000 meters each day and even hurt my ear once in a 7-meter dive," he said. Wen's arduous training for the film also included a 180-day's living with a group of autistic people, which Wen says helped him get closer to their inner mind, a world isolated from the rest of society and constructed by themselves. The work was worth it. Wen, recently won "Best Actor " at the Shanghai International Film Festival for his performance in Ocean Heaven. Last week, Wen played on a soccer team composed of celebrities from Chinese mainland against a celebrity soccer team from Hong Kong at the Bird's Nest. Wen enjoyed playing on the team and said he would have gone to South Africa to watch World Cup games with some of his teammates, who participated in a luxury tour organized by one of China's top travel services Byecity.com, if it hadn't been for his busy work schedule. Wen has proudly said he succeeded in predicting Spain would be the champion. "Call me 'little octopus'," he said, referring to the world famous octopus Paul, which successfully predicted the results of eight key games in the World Cup. The meaning, in Chinese, of Wen's first name, Zhang, relates to octopus and many of Wen's more devoted fans call themselves 'octopuses'. Wen's marriage to A-list actress Ma Yili dominated headline space in domestic media's entertainment pages because she is eight years older than him. However, Wen has so far proved to be an ideal domestic husband, according to Ma. Wen dotes on her, making sure she only had warm towels to use when she was pregnant and always coming home by 9:30 pm at the latest, she said. Now the young father wants to help more children, especially autistic children. He and his wife has launched a charity foundation "We Can".